Samsung’s Wi-Fi-enabled Smart Signage TV is aimed at businesses that want signage out of the box, without the complexity of an enterprise-level system. With its new Smart Signage TV (SSTV), Samsung is targeting what it says is an overlooked piece of the digital signage market: mom-and-pop shops. Pitched as a simple, all-in-one solution, this Wi-Fi-enabled smart TV is aimed at businesses that want signage out of the box, without the cost or complexity of an enterprise-level system. 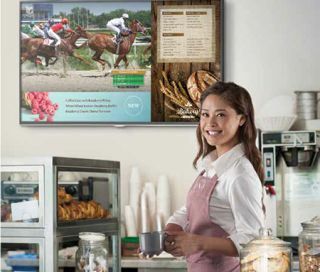 “Think of your café, bagel shop, stationary store, doctor’s office, accounting office, things like that,” says Samsung’s Michael O’Halloran, product marketing manager for large format displays. Samsung estimates there are more than 2 million such businesses in the U.S. Most, O’Halloran says, aren’t even aware commercial displays are available. If they deploy signage at all, it’s with an ad hoc set up that displays on a standard TV. “They’re going to a retail outlet like a BestBuy or a club store like a Costco or Sam’s and simply bringing back a television,” O’Halloran says. The SSTV and the marketing strategy promoting it are designed to capture that business, which falls outside Samsung’s B2B sales channels. There are currently two models available—a 40-inch display for $749 and a 48-inch for $999. “We benchmarked pricing in consumer TVs that would have a smart chip plus Wi-Fi,” O’Halloran says, but the build “is more akin to a hospitality-type offering.” Indeed, Samsung is providing customers commercial-grade service, with a three-year onsite warranty that guarantees the display for 16-hour-a-day use and access to its B2B support center. But while the SSTV is a commercial model, it’s packaged for retail appeal. The initial launch makes the displays available at Sam’s Club, Amazon, and Costco stores, where shoppers will be greeted by colorful consumer packaging and point-of- purchase signage, including an informational video. (Availability discussions with other brick-and-mortar retailers are ongoing, O’Halloran says.) And where Samsung’s other commercial displays have been marketed via B2B media, the SSTV will have a consumer-focused media blitz behind it. The company, for example, is launching a storefront makeover contest that rewards the winner with a free SSTV installation. When it comes to the device itself, ease of use is emphasized. The TV ships with a wall mount, a stand, and a USB stick for loading content, suggesting that the device is ready to install out of the box. The package also includes a license of Magic Info Express, a content management system created by Samsung. Similar to the enterprise version of Magic Info in name only, O’Halloran says, Express was “built from the ground up” to provide a painless a user experience. The software comes preloaded with more than 200 templates. Some even display vertically, though the vertical templates can’t run video. Landscape templates on the other hand, are multimedia ready, supporting a combination of video, text and stills. Video can be played via an embedded TV tuner or an HDMI signal from, for example, a set top box or Blu-ray player. Users can divide the display into multiple zones, with live TV or video played alongside promotions or point-of-sale ads. There’s also a scheduling feature that allows content to be programmed not only by day but also within day segments, with each segment supporting multiple templates. Brooklyn-based David Zuckerman is a regular contributor to AV Technology magazine.